1 A None No Power Seat 1 A is a standard BEST Economy Class seat located at a bulkhead. The adjacent seat is blocked to provide additional personal space and there is additional legroom. The tray table is stored in the armrest making the armrest immovable and slightly reducing seat width. The close proximity to the galley and lavatory might be bothersome. There is no floor storage available for use during take-off and landing. 1 C None No Power Seat 1 C is a standard BEST Economy Class seat located at a bulkhead. The adjacent seat is blocked to provide additional personal space and there is additional legroom. The tray table is stored in the armrest making the armrest immovable and slightly reducing seat width. The close proximity to the galley and lavatory might be bothersome. There is no floor storage available for use during take-off and landing. 1 D None No Power Seat 1 D is a standard BEST Economy Class seat located at a bulkhead. The adjacent seat is blocked to provide additional personal space and there is additional legroom. The tray table is stored in the armrest making the armrest immovable and slightly reducing seat width. The close proximity to the galley and lavatory might be bothersome. There is no floor storage available for use during take-off and landing. 1 F None No Power Seat 1 F is a standard BEST Economy Class seat located at a bulkhead. The adjacent seat is blocked to provide additional personal space and there is additional legroom. The tray table is stored in the armrest making the armrest immovable and slightly reducing seat width. The close proximity to the galley and lavatory might be bothersome. There is no floor storage available for use during take-off and landing. 10 A None No Power Seat 10 A is a standard Economy Class seat located in an area with additional legroom and just forward of the Exit Row. Seat back recline is limited. This seat may be selected for an additional fee. 10 B None No Power Seat 10 B is a standard Economy Class seat located in an area with additional legroom and just forward of the Exit Row. Seat back recline is limited. This seat may be selected for an additional fee. 10 C None No Power Seat 10 C is a standard Economy Class seat located in an area with additional legroom and just forward of the Exit Row. Seat back recline is limited. This seat may be selected for an additional fee. 10 D None No Power Seat 10 D is a standard Economy Class seat located in an area with additional legroom and just forward of the Exit Row. Seat back recline is limited. This seat may be selected for an additional fee. 10 E None No Power Seat 10 E is a standard Economy Class seat located in an area with additional legroom and just forward of the Exit Row. Seat back recline is limited. This seat may be selected for an additional fee. 10 F None No Power Seat 10 F is a standard Economy Class seat located in an area with additional legroom and just forward of the Exit Row. Seat back recline is limited. This seat may be selected for an additional fee. 11 A None No Power Seat 11 A is a standard Economy Class seat located in an Exit Row with plenty of additional legroom and just forward of the other Exit Row. Seat back recline is limited. This seat may be selected for an additional fee. There is no floor storage for this seat during takeoff and landing. 11 B None No Power Seat 11 B is a standard Economy Class seat located in an Exit Row with plenty of additional legroom and just forward of the other Exit Row. Seat back recline is limited. This seat may be selected for an additional fee. There is no floor storage for this seat during takeoff and landing. 11 C None No Power Seat 11 C is a standard Economy Class seat located in an Exit Row with plenty of additional legroom and just forward of the other Exit Row. Seat back recline is limited. This seat may be selected for an additional fee. There is no floor storage for this seat during takeoff and landing. 11 D None No Power Seat 11 D is a standard Economy Class seat located in an Exit Row with plenty of additional legroom and just forward of the other Exit Row. Seat back recline is limited. This seat may be selected for an additional fee. There is no floor storage for this seat during takeoff and landing. 11 E None No Power Seat 11 E is a standard Economy Class seat located in an Exit Row with plenty of additional legroom and just forward of the other Exit Row. Seat back recline is limited. This seat may be selected for an additional fee. There is no floor storage for this seat during takeoff and landing. 11 F None No Power Seat 11 F is a standard Economy Class seat located in an Exit Row with plenty of additional legroom and just forward of the other Exit Row. Seat back recline is limited. This seat may be selected for an additional fee. There is no floor storage for this seat during takeoff and landing. 12 A None No Power Seat 12 A is a standard Economy Class seat located in the Exit Row. It features plenty of additional legroom. This seat may be selected for an additional fee. There is no floor storage for this seat during takeoff and landing. 12 B None No Power Seat 12 B is a standard Economy Class seat located in the Exit Row. It features plenty of additional legroom. This seat may be selected for an additional fee. There is no floor storage for this seat during takeoff and landing. 12 C None No Power Seat 12 C is a standard Economy Class seat located in the Exit Row. It features plenty of additional legroom. This seat may be selected for an additional fee. There is no floor storage for this seat during takeoff and landing. 12 D None No Power Seat 12 D is a standard Economy Class seat located in the Exit Row. It features plenty of additional legroom. This seat may be selected for an additional fee. There is no floor storage for this seat during takeoff and landing. 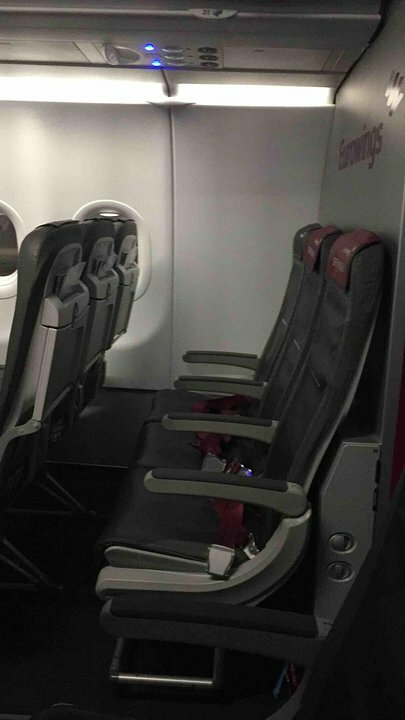 12 E None No Power Seat 12 E is a standard Economy Class seat located in the Exit Row. It features plenty of additional legroom. This seat may be selected for an additional fee. There is no floor storage for this seat during takeoff and landing. 12 F None No Power Seat 12 F is a standard Economy Class seat located in the Exit Row. It features plenty of additional legroom. This seat may be selected for an additional fee. There is no floor storage for this seat during takeoff and landing. 2 A None No Power Seat 2 A is a standard BEST Economy Class seat. The adjacent seat is blocked to provide additional personal space and there is additional legroom. 2 C None No Power Seat 2 C is a standard BEST Economy Class seat. The adjacent seat is blocked to provide additional personal space and there is additional legroom. 2 D None No Power Seat 2 D is a standard BEST Economy Class seat. The adjacent seat is blocked to provide additional personal space and there is additional legroom. 2 F None No Power Seat 2 F is a standard BEST Economy Class seat. The adjacent seat is blocked to provide additional personal space and there is additional legroom. 3 A None No Power Seat 3 A is a standard BEST Economy Class seat. The adjacent seat is blocked to provide additional personal space and there is additional legroom. 3 C None No Power Seat 3 C is a standard BEST Economy Class seat. The adjacent seat is blocked to provide additional personal space and there is additional legroom. 3 D None No Power Seat 3 D is a standard BEST Economy Class seat. The adjacent seat is blocked to provide additional personal space and there is additional legroom. 3 F None No Power Seat 3 F is a standard BEST Economy Class seat. The adjacent seat is blocked to provide additional personal space and there is additional legroom. 30 C None No Power Seat 30 C is a standard Economy Class seat. The close proximity to the galley and lavatory might be bothersome. 30 D None No Power Seat 30 D is a standard Economy Class seat. The close proximity to the galley and lavatory might be bothersome. 31 A None No Power Seat 31 A is a standard Economy Class seat located in the last row of the aircraft. This seat has limited recline and is missing a window. The proximity to the galley and lavatory might be bothersome. 31 B None No Power Seat 31 B is a standard Economy Class seat located in the last row of the aircraft. This seat has limited recline and is missing a window. The proximity to the galley and lavatory might be bothersome. 31 C None No Power Seat 31 C is a standard Economy Class seat located in the last row of the aircraft. This seat has limited recline and is missing a window. The proximity to the galley and lavatory might be bothersome. 31 D None No Power Seat 31 D is a standard Economy Class seat located in the last row of the aircraft. This seat has limited recline and is missing a window. The proximity to the galley and lavatory might be bothersome. 31 E None No Power Seat 31 E is a standard Economy Class seat located in the last row of the aircraft. This seat has limited recline and is missing a window. The proximity to the galley and lavatory might be bothersome. 31 F None No Power Seat 31 F is a standard Economy Class seat located in the last row of the aircraft. This seat has limited recline and is missing a window. The proximity to the galley and lavatory might be bothersome. 4 A None No Power Seat 4 A is a standard Economy Class seat located in an area with additional legroom. This seat may be selected for an additional fee. 4 B None No Power Seat 4 B is a standard Economy Class seat located in an area with additional legroom. This seat may be selected for an additional fee. 4 C None No Power Seat 4 C is a standard Economy Class seat located in an area with additional legroom. This seat may be selected for an additional fee. 4 D None No Power Seat 4 D is a standard Economy Class seat located in an area with additional legroom. This seat may be selected for an additional fee. 4 E None No Power Seat 4 E is a standard Economy Class seat located in an area with additional legroom. This seat may be selected for an additional fee. 4 F None No Power Seat 4 F is a standard Economy Class seat located in an area with additional legroom. This seat may be selected for an additional fee. 5 A None No Power Seat 5 A is a standard Economy Class seat located in an area with additional legroom. This seat may be selected for an additional fee. 5 B None No Power Seat 5 B is a standard Economy Class seat located in an area with additional legroom. This seat may be selected for an additional fee. 5 C None No Power Seat 5 C is a standard Economy Class seat located in an area with additional legroom. This seat may be selected for an additional fee. 5 D None No Power Seat 5 D is a standard Economy Class seat located in an area with additional legroom. This seat may be selected for an additional fee. 5 E None No Power Seat 5 E is a standard Economy Class seat located in an area with additional legroom. This seat may be selected for an additional fee. 5 F None No Power Seat 5 F is a standard Economy Class seat located in an area with additional legroom. This seat may be selected for an additional fee. 6 A None No Power Seat 6 A is a standard Economy Class seat located in an area with additional legroom. This seat may be selected for an additional fee. 6 B None No Power Seat 6 B is a standard Economy Class seat located in an area with additional legroom. This seat may be selected for an additional fee. 6 C None No Power Seat 6 C is a standard Economy Class seat located in an area with additional legroom. This seat may be selected for an additional fee. 6 D None No Power Seat 6 D is a standard Economy Class seat located in an area with additional legroom. This seat may be selected for an additional fee. 6 E None No Power Seat 6 E is a standard Economy Class seat located in an area with additional legroom. This seat may be selected for an additional fee. 6 F None No Power Seat 6 F is a standard Economy Class seat located in an area with additional legroom. This seat may be selected for an additional fee. 7 A None No Power Seat 7 A is a standard Economy Class seat located in an area with additional legroom. This seat may be selected for an additional fee. 7 B None No Power Seat 7 B is a standard Economy Class seat located in an area with additional legroom. This seat may be selected for an additional fee. 7 C None No Power Seat 7 C is a standard Economy Class seat located in an area with additional legroom. This seat may be selected for an additional fee. 7 D None No Power Seat 7 D is a standard Economy Class seat located in an area with additional legroom. This seat may be selected for an additional fee. 7 E None No Power Seat 7 E is a standard Economy Class seat located in an area with additional legroom. This seat may be selected for an additional fee. 7 F None No Power Seat 7 F is a standard Economy Class seat located in an area with additional legroom. This seat may be selected for an additional fee. 8 A None No Power Seat 8 A is a standard Economy Class seat located in an area with additional legroom. This seat may be selected for an additional fee. 8 B None No Power Seat 8 B is a standard Economy Class seat located in an area with additional legroom. This seat may be selected for an additional fee. 8 C None No Power Seat 8 C is a standard Economy Class seat located in an area with additional legroom. This seat may be selected for an additional fee. 8 D None No Power Seat 8 D is a standard Economy Class seat located in an area with additional legroom. This seat may be selected for an additional fee. 8 E None No Power Seat 8 E is a standard Economy Class seat located in an area with additional legroom. This seat may be selected for an additional fee. 8 F None No Power Seat 8 F is a standard Economy Class seat located in an area with additional legroom. This seat may be selected for an additional fee. 9 A None No Power Seat 9 A is a standard Economy Class seat located in an area with additional legroom. This seat may be selected for an additional fee. 9 B None No Power Seat 9 B is a standard Economy Class seat located in an area with additional legroom. This seat may be selected for an additional fee. 9 C None No Power Seat 9 C is a standard Economy Class seat located in an area with additional legroom. This seat may be selected for an additional fee. 9 D None No Power Seat 9 D is a standard Economy Class seat located in an area with additional legroom. This seat may be selected for an additional fee. 9 E None No Power Seat 9 E is a standard Economy Class seat located in an area with additional legroom. This seat may be selected for an additional fee. 9 F None No Power Seat 9 F is a standard Economy Class seat located in an area with additional legroom. This seat may be selected for an additional fee. Wi-Fi access will be added from Winter 2016. Additional information will be provided on eurowings.com. Eurowings' Airbus A320 fleet is used on heavily traveled routes within Europe. Entertainment onboard is provided by Wings Entertain - a streaming to your device feature. Music, movies, television series, children's feature, games, and audio books are available. The free Wings Entertain app should be downloaded from the Apple and/or Google app stores before your flight. Terrible little legroom for a 1,88 m person ... better choose a seat with extra legroom. HAM to PMI! Terrible little legroom for a 1,88 person... better choose a seat with extra legroom! Legroom on 18E was for a flight from Hamburg to Dusseldorf ok, and we had a nice wing view. It is far to Little legroom! I nearly paniked. I never will chose this Aircraft again! Plenty of room and a nice view to the engine. Plenty of room, seperate overhead compartments only for exit rows. Eurowings flies 1 versions of Airbus A320.